Paris, 1919.The world's leaders have gathered to rebuild from the ashes of the Great War. But for one woman, the City of Light harbors dark secrets and dangerous liaisons, for which many could pay dearly. 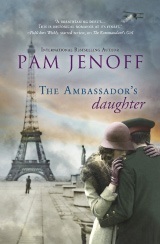 The Ambassador's Daughter was a very enjoyable read - easy going and yet possessing a remarkable depth of feeling. I have not read any of Jenoff's work before and so came to this prequel with no preconceptions about the characters or storyline. Margot is a very likeable heroine, unsure and yet fired with enthusiasm for life and a desire to do something, even if she's not entirely sure what as the novel starts. Georg is a great romantic interest (even though I kept thinking of The Sound of Music and Christopher Plummer every time I read his name!) and I found the relationship between him and Margot believable despite its rapid progression. I put the book down wishing I could find out what happened next and I will certainly try to read Jenoff's other books in the future as I found her writing style engaging and relaxing to read. I can certainly recommend this book to lovers of historical fiction.